It's a case of deja vu this week as once again I'm complaining about an over-abundance of crime dramas this week with another two returning detective shows populating our TV screens. The first is BBC1's Shetland, which returns after a successful two-part pilot last year. 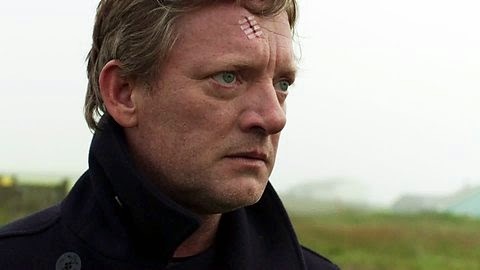 The drama, based on the novels by Ann Cleeve, reintroduces us to DI Jimmy Perez (Douglas Henshall) who is forced to patrol an island where crimes are rarely committed. However, occasionally, a grisly murder occurs and the victim in this first episode is free-spirited schoolgirl Catherine Ross. Early scenes see Catherine visit the home of local outcast Magnus Bain (Brian Cox) who lives with a menagerie of scary-looking birds. With Catherine's body washing up on the beach fairly near to Malcolm's hut, the obvious finger of blame is pointed in his direction. But Jimmy doesn't think the case is that open-and-shut and instead urges his charges to look further into the case. Eventually they discover that Catherine's teacher Hugo Scott (Tunji Kasim) has feelings for her and Jimmy thinks that he knows more than he's letting on. The case takes an interesting turn when connections start to appear between Catherine's murder and the disappearance of a young girl called Catriona almost twenty years previous. With Catherine and Catriona living in the same house the similarity in both cases is strengthened when it transpires that Magnus was arrested in conjunction with the earlier crime. However, as is always the case is dramas such as Shetland, several other characters begin looking shifty and there's an extremely deadly reveal in the last few minutes to compel viewers to return for the concluding instalment. To me Shetland's most distinguishing attribute is its literal use of light and shade as the islands are synonymous with their erratic periods of sunlight. That's true of this first episode in which the constant light of midsummer is making everybody restless and uneasy. Like a lot of crime dramas, Shetland also exploits the fact that it is set in a small community albeit it one that's a lot less quaint than Midsomer Murders. Everybody is fairly distrustful of their neighbours in Shetland and it's a community where a recluse like Magnus can quickly be treated like a pariah by those around him. These qualities aside, Shetland is a fairly formulaic police procedural but it's well-executed by its cast and crew. Director Jan Bauer exploits the Shetland scenery to full effect while Gaby Chiappe provides a well-paced adaptation of Cleeve's source novel. One thing I will say is that Shetland really didn't welcome in viewers who may have missed last year's pilot. Even though I watched it I can't really recall the relationship between Mark Bonnar's Duncan with Jimmy and his daughter Cassie. A little refresher would have been good to get everybody up to speed and I felt that this mistreatment of new viewers created a sense of alienation. 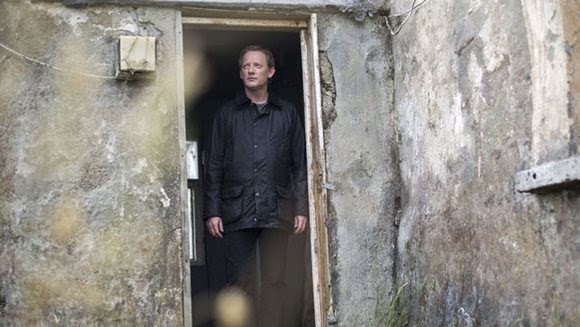 Douglas Henshall proved that he was a reliable leading man bringing a bit of brooding charm to Jimmy Perez. But it was Brian Cox who stole the show as the creepy Magnus as he made the audience wonder whether or not he was in the wrong. However, while I had nothing against Shetland, it really didn't interest me enough to return for a second helping. One crime drama that I've never been a fan of is Law and Order UK which returned for a staggering eighth series last week. This by-the-books adaptation of the American hit series has somehow proved popular with a certain section of society though I can't see why. The troubled DI Ronnie Brooks (Bradley Walsh) is still at the forefront of operations however this episode saw him welcome a new partner in the form of Joe Hawkins (Ben Bailey Smith). Unlike his Ronnie's previous partners, Joe is a fairly sensitive soul and knows how to communicate with suspects without raising his voice. Indeed, at one point he stopped Ronnie's questioning of a witness in order to let the man fill the silence himself. Obviously old-school Ronnie is initially sceptical of Joe's techniques but the episode's conclusion sees that the pair have formed a mutual respect for each other. The first episode was based around the murder of a jewellery dealer who had his teeth smashed out and his hands chopped off. I felt that this episode was going to end with an obvious culprit whether it be a jealous business partner or a former criminal associate who tried to convince the deceased to carry out one last job. Instead the story interlinked with a trial that Ronnie was about to testify at involving the death of a man and his young daughter at the hands of crime boss Dale Horgan (Peter Barrett). The second half of the episode saw Horgan's trial continue without a jury as Jacob and Kate (Dominic Rowan and Georgia Taylor) took on legal powerhouse Eleanor Richmond (Helen Baxendale). Meanwhile, back at the police station, Ronnie and Joe tried to coax a young graffiti artist into giving a witness statement against Dale Horgan' associates. Maybe it was my low expectations, but I have to say I quite enjoyed this episode of Law and Order UK. This was primarily due to the introduction of Joe, whose sensitive side is quite rare for a young male police officer on a British crime drama. The odd couple dynamic between Ronnie and Joe worked quite a treat and seemingly reinvigorated the tired character of Ronnie. 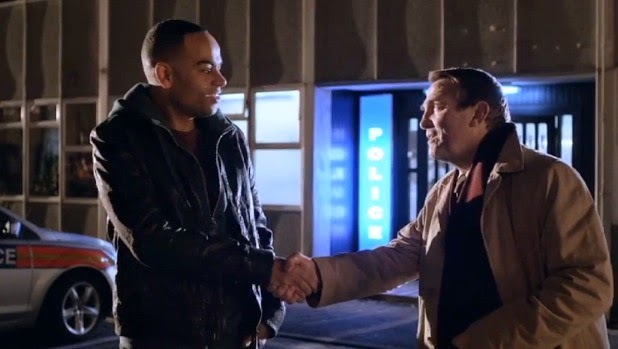 The chemistry between Bradley Walsh and Ben Bailey Smith is undeniable and the latter is incredibly natural in what is his first major TV role. In addition old hands Patterson Joseph and Peter Davidson add a little bit of experience to proceedings even though both feel like they're simply cameoing in the programme. Unfortunately, any good feeling I had for Law and Order UK disappeared when we got to the legal side of the show which is just as weak as ever. I just don't believe in the characters of Jacob and Kate partly because of the performances delivered by Rowan and Taylor. The legal side of the programme looks even weaker if you compare it to a superior drama in the same genre such as the magnificent Silk. I honestly think that not many people would mind if the show simply concentrated on the investigations of Ronnie and Joe as to me these are the only sympathetic characters in the show. Ultimately I would say that the programme has definitely run its course and, despite the brief return to form, I think that Law and Order UK should definitely be put out to pasture. 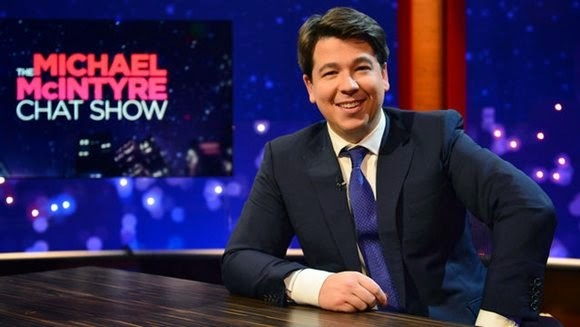 Away from crime drama this week we had yet another comedian try to broaden their horizons as The Michael McIntyre Chat Show hit our screens. Although I knew the programme was coming, I did feel that it received very little in the way of promotion before it aired last Monday. I have to say I didn't expect much going in, primarily as it was placed in the dreaded 10:35 slot for shows that BBC1 aren't that proud of. To his credit McIntyre proved to be an endearing presence, as he often is, although he really didn't ask his guests that many probing questions. I did feel that the programme was better depending on the quality of the guest so to me it was at its best when Sir Terry Wogan appeared and reached a lull by the time we got to Lord Sugar. One of the things that irritated me the most about McIntyre was the fact that he continually broke the fourth wall whether that was to inform Lily Allen that somebody was talking to him in his ear or the pre-credit sequence in which we saw him talk to the audience ahead of the show itself. In fact McIntyre seemed more at home addressing the audience than he did when he was forced to go into chat show host mode. His interactions with the crowd provided the funniest moments especially when he played the first ever round of 'Send to All'. Though not as bad as some celebrity-fronted chat shows, especially the one that Allen herself hosted, I don't think that McIntyre really suits the chat show format in a way that others such as Alan Carr and Graham Norton do. Thankfully his likeablity shines through which doesn't make watching the programme a chore but at the same time I don't think I'd ever choose to watch it again. Finally this week another one of BBC4's new comedy commissions in the form of The Walshes. The sitcom is co-written by the brilliant Graham Linehan who has worked alongside the programme's stars, Irish comedy troupe Diet of Worms. An incredibly traditional comedy, the first episode of The Walshes introduces us to the titular family as they're about to meet the boyfriend of daughter Ciara (Amy Stephenson) for the first time. However the rest of the Walsh family believe that Graham (Shane Langan) is a doctor which leads to a rather fantastic comic misunderstanding between him and Walsh patriarch Tony (Niall Gaffney). Elsewhere mother Carmel (Philippa Dunne) is busy making a roast dinner despite the fact that Ciara and Graham are going out for something to eat. All in all nothing much happens in The Walshes but I don't feel that that's necessarily a negative element. As always Linehan has presented a group of incredibly weird characters who are brought together by similar circumstances and in this case all happen to be family members. The Walshes certainly doesn't have the usual surreal edge that Linehan's comedies possess but what it lacks in creativity it makes up for with some really well-observed moments. Carmel asking Ciara to taste her gravy while she was having a bath was comedy gold while I loved Graham getting more and more worried as he spent more time with the Walsh family. Though not as funny as it should have been, I really believed that the Walshes were a real family and this made me enjoy the programme a lot more. It will be interesting to see if the sitcom can maintain the standard of this first episode, but I'm definitely willing to give it the benefit of the doubt.